To re-enforce and review color relationships while creating an active environment in the classroom (good for rainy days). 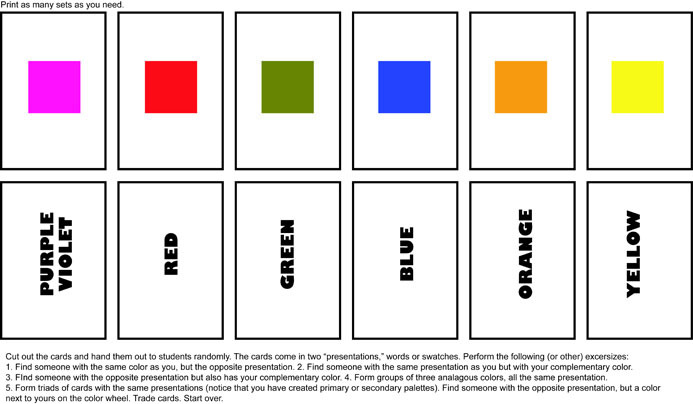 Review Complementary, Analogous, and Triadic color relationships. I came up with this "game" as a review exercise and thought others might be able to use it. The image file can be printed (multiple copies) or cards can be created from scratch. 1. Find someone with the same color as you, but the opposite presentation. 2. Find someone with the same presentation as you but with your complementary color. 3. Find someone with the opposite presentation but also has your complementary color. 4. Form groups of three analogous colors, all the same presentation. 5. Form Triads of cardholders with the same presentations (notice that you have created either primary or secondary palettes). 6. Find someone with the opposite presentation but an analogous color on Color Wheels . Trade cards and start over.